Roy, Fernande. "Patriotes". The Canadian Encyclopedia, 26 September 2017, Historica Canada. 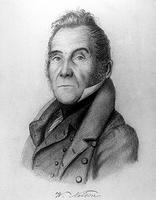 https://www.thecanadianencyclopedia.ca/en/article/patriotes. Accessed 22 April 2019. The Patriotes was the name given after 1826 to the Parti canadien and to the popular movement that contributed to the Rebellions of 1837-38 in Lower Canada. The primarily francophone party, led mainly by members of the liberal professions and small-scale merchants, was widely supported by farmers, day-labourers and craftsmen. 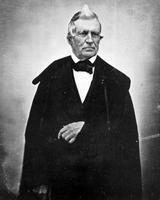 Its more distinguished leaders included Louis-Joseph Papineau, Jean-Olivier Chénier and Wolfred Nelson. Though the Patriotes dominated the elected House of Assembly in Lower Canada, their adversaries, the merchant bourgeoisie, the aristocracy and the colonial administration, controlled the appointed Legislative Council, which held most of the power. The Patriotes demanded greater power for assembly members, including increased ministerial responsibility and eligibility for appointment to the council. Their demands, put forth in the name of democracy and the right of peoples to self-government, marked a liberal, nationalist and anticolonial ideology. Some historians state that the Patriotes' political program included a comprehensive economic-development project for all Lower Canada, designed to benefit the majority of its inhabitants and, of course, their representatives. Others argue that, behind a liberal façade, this was really a retrograde and conservative socioeconomic goal. The Patriotes, except for those of 1838, favoured the retention of the seigneurial system and more readily supported agricultural than commercial interests. By blocking the economic projects of their adversaries, they delayed the development of British capitalism in the colony. But their positions were neither that clear nor that rigid. As social and economic conflict intensified during the 1830s, the party radicalized both its tactics and its goals, though not without some schisms between its moderate and extremist factions. In 1834 the Patriotes listed their major complaints in the "Ninety-Two Resolutions" sent to the British government. Britain rejected this call for reform and settled the quarrel over subsidies through the Russell Resolutions of March 1837, which authorized the governor of the colony to obtain his budgetary estimates without a vote of the assembly. This decision caused many demonstrations; verbal violence soon gave way to physical violence. 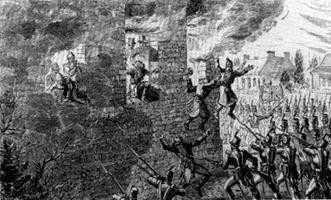 The Rebellions of 1837-38 were followed by the torching of Patriotes' homes, imprisonments, exiles, trials and hangings. The failure of the rebellions led to the disappearance of the Parti patriote. Some former leaders, however, returned to active politics in the united Province of Canada. See also Fils de la Liberté.